Interview by Yarin magazine of Turkey, august 2006. Question: What are the goals of Israel in its war on Lebanon? What do you think Israel is trying to do? 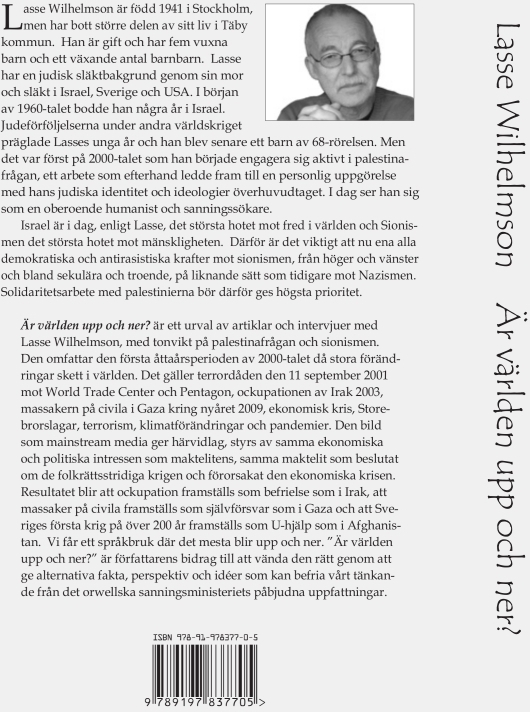 Lasse Wilhelmson: The earlier occupation following the 1982 invasion of Lebanon resulted in the forming of Hezbollah. Later, in 2000, the occupant was ejected by Hezbollah. Hezbollah has patiently created a popularly moored political, religious and social movement, with an effective guerilla defense of Lebanese territory. They have proved themselves true patriots and anti-imperialists. Israel, unable to directly get at Hezbollah militarily or politically, have destroyed the infrastructure of Lebanon and is terrorizing the civilian population. With Lebanon as the intimidating example, Israel wishes to show other countries in the Middle East what they can expect unless they accept that ”Might makes right”. This mentality is a direct continuation of the absolute lack of compromise as presented by Zeév Jabotinsky in his classic essay ”The Iron Wall” from 1937. It is one of the most brilliant political documents ever written, and necessary reading for anyone wishing to comprehend the racist logic behind the brutality of the state of Israel’s current politics. The long-term goals that Israel now are trying to bring about was formulated in Jerusalem in 1982 as ”The Zionist plan for the Middle East”. This was later followed by the Neocon document ”A Clean Break” in 1996, which was presented to then-Israeli Prime Minister Benjamin Netanyahu. The purpose here is to expand the Jewish state at least to the Jordan River. The means are to create all kinds of chaos and to denationalize surrounding states in the region. But the utopia, to become a model state for western colonialism/imperialism, was formulated already by the founder of Zionism, Theodor Herzl, who in 1896 wrote ”The Jewish State”. This merging of Zionism and Anglo-American imperialism continues in the Neocons’ foreign policy project PNAC (The Project for a New American Century), which was first presented to the leaders of the Bush administration in 2000. Following the terrorist attacks of September 11, 2001, this culminated in the new imperial doctrine of the Bush administration: ”The fight against terrorism using preemptive war” — contrary to International Law. My conclusion therefore is that neither Hizbollah, nor for that matter Hamas, are the primary targets for Israel or for the USA. Their focus on so called terror organizations is just an excuse, in order to be able to destroy Lebanon and complete the expulsion of as many Palestinians as possible from the area between the Mediterranean Sea and the river Jordan. Something that have so far been fairly successful. Q: Is there a possibility that Israel may attack Iran and Syria? What could happen then? LW: Israel, the Jewish lobby and the Neocons in the USA have for years had an attack on Iran on the top of their agenda. The Bush administration gave Israel a go-ahead already last summer, by saying that they didn’t intend to stop them. We must not forget that Israel itself have already bombed Iraq once before, in 1981. Israel would of course prefer that the USA do the job for them, with the cooperation from NATO and the EU. Syria presently lacks a popularly supported military and political power, and is with its traditional defense an easy prey for Israel. Furthermore there is now also Lebanon as a warning example, and since earlier, Egypt. This suggests that Syria will remain passive and that Israel will possibly for the time being leave them alone. An attack on Iran will, however, carry a political cost, the distribution of which is now a matter of an internal showdown within western imperialism. Iran is currently the ”thorn in the flesh” that must go away. Many argue that the third world war has already started. The definite confirmation of this could be an attack on Iran. This unless Hizbollah’s military and political successes, Hamas’ political successes and the resistance in Iraq and Afghanistan further weakens the Neocons’ grip on the White House and lead to increasing disagreements within western imperialism. On the other hand, a tiger is at its most dangerous when wounded. That applies also to the imperial paper-tiger. I wouldn’t be surprised if a new 9-11 in such a case is staged as a pretext for a nuclear attack on Iran. The effects of such an attack may create a revolutionary situation in the whole region — thanks to Hizbollah’s already historical example. Q: Israel’s mass killings in Lebanon caused rise of anti-Israeli feelings. If Israel wants to secure itself and its citizens, why does it just increase the numbers of Israel’s enemies? LW: It would be odd if the criminal acts of Israel would not cause a diminished support for the racist apartheid state, and thereby also for its Jewish citizens. But this colonial remnant will sooner or later dissolve, as happened with the former regime in South Africa. The Jews in Israel need to learn from the Afrikaners of South Africa and stop regarding themselves as belonging to the Master Race. That is, however, up to them, and at the same time their only chance to live in peace with their neighbors. Tragically, they do not understand their own good, blinded as they are by their own Master Race mentality. Q: All these developments blur the line between Zionism and ‘just being an Jewish.’ Do you find this overlapping dangerous for the good of Israeli people in the long run? There are many segment in Israeli society who are upset with events. When will they be able to direct the country to a more moderate, pro-negotiation-concession way? LW: Zionism, through its Jewish congregations, is the dominant interpretation of Judaism today, They regard Zionism as a positive revitalization of Judaism. In Israel, politics and religion are merged together. The only Jewish organization that is actively working against the Zionist occupation of Judaism is Neturei Karta. On orthodox religious grounds they burn Israeli flags at their demonstrations. Politically, however, their impact is marginal. As long as the Jews in the diaspora and in Israel do not break with the Jewish state and the goal of Zionism, they are co-responsible for this muddying, which may lead to a disaster for them. The Israeli ”left” and the ”peace-movement” are also dominated by Zionism. They wish to live in peace in their Jewish state with the Palestinians in their own walled-in pseudo-state on the remaining ten percent of the original Palestine. And receive international recognition of the 90 percent that has already been stolen. This can never be a road to peace. In my opinion, today’s Israel without a constitution and without fixed borders, lacks legitimacy. Q: Some people say: What Nazi regime had done to Jews decades ago is now being done to Palestinian’s by Israeli government. Does this comparison make you sorry? LW: Ideologically there is a large correspondence between Nazism/Fascism and Zionism, something I showed in my article ”Zionism ­ More Than Traditional Colonialism and Apartheid” in 2004. And certainly one can draw parallels between for example the Warsaw ghetto uprising and the Palestinian resistance in the Gaza Strip, something that is at the same time a historical irony and a human tragedy. But it’s more than enough to criticize Israel’s policy on its own merits. It has managed to surpass the former apartheid regime of South Africa, when it comes to ethnic cleansing, and even the regime in Nazi Germany, when it comes to destroying the life conditions of the peoples in its own neighbourhood. The comparison is therefore to Israel’s disadvantage. This makes me very sad, on account of all those afflicted by Israel’s atrocities. Q: What should be done to secure an ever-lasting peace? What should Israel do? What should America do? What should Arab-Islam world do? And what can Turkey do, which seems to be eager to play a kind of mediator? LW: Israel must be transformed into a state where every citizen has the same rights irrespective of ethnical or religious affiliation, and the Palestinian refugees must be allowed to come home. This is the key to peace in the whole of the Middle East, and likely more than that. Friends of peace in Israel need to fight for this together with Palestinians, similar to what ANC earlier did in South Africa. The United States should adopt a policy that is good for their own people rather than for Israel, and stop terrorizing the world with its imperialistic wars. The Arab-Muslim world needs to follow Hezbollah’s admirable example, before it’s too late. 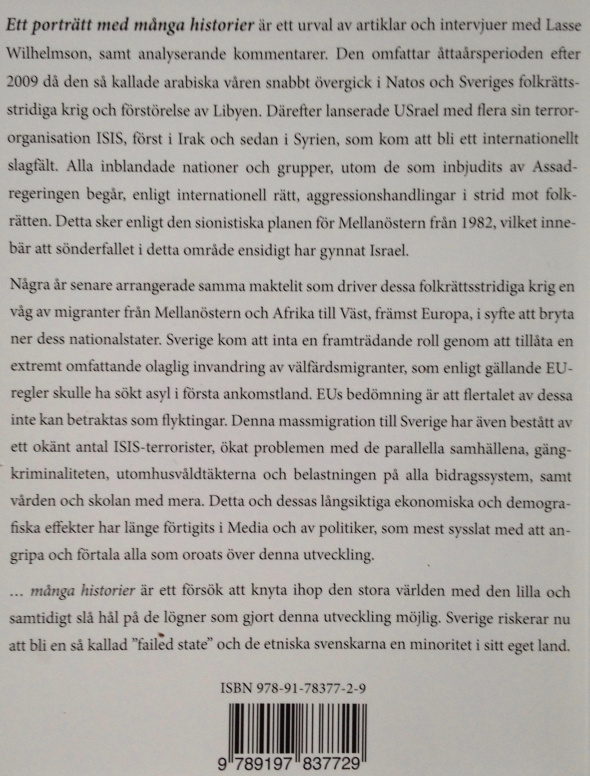 Turkey should break with NATO and conduct an alliance-free neutrality politics, like Sweden earlier did. Back then we worked as an important bridge between the Western world and the so called Third World. Sweden’s international role in this respect has sadly, following the murder of Prime Minister Olof Palme, gradually been replaced by a lapdog policy towards the USA. A foreign policy similar to Palme’s would definitely further a possible Turkish mediator role. This ought to be prioritized before a membership in the imperialistic EU, that will isolate Turkey from the Muslim world. This is a path behind which it is possible to create a wide popular unity.